Fanack Home / Extremism / What led to the rise of IS in Iraq? In 2003 the US invaded Iraq in response to the attacks of 11 September 2001. The threat of Iraq’s possible possession of weapons of mass destruction and alleged attempts to create a link between Iraqi President Saddam Hussein and al-Qaeda terrorists— both of which were untrue—were the reasons given for the invasion. An important cause of the later rise of the Islamic State was the decision of the new American governor, Paul Bremer, to distribute governmental positions according to the proportional division of the various sects. Shiites formed a majority of 60 percent, so they were given 60 percent of government and other important positions. They used their new power to marginalize the Sunni minority that had dominated Iraq under Saddam Hussein. The most important predecessor of Islamic State leader Abu Bakr al-Baghdadi was the Jordanian Abu Musab al-Zarqawi, whose proper name was Ahmad Fadel Nazal al-Khalayleh. Al-Zarqawi went to fight the Soviet Union in Afghanistan in 1989, but when he arrived, the Soviets were already departing. He returned to Jordan, where he was accused of plotting to overthrow the monarchy. In jail, he was influenced by the extremist thinker Abu Mohamed al-Maqdisi. In the summer of 2003 he went to the Sunni regions of Iraq, where he established a terrorist cell in Fallujah. Al-Zarqawi became infamous as the leader of al-Qaeda in Iraq, which later became the Islamic State in Iraq. He was responsible for several kidnappings and beheadings, and he declared “all-out war” on Shiites in Iraq, against the wishes of al-Qaeda-leader Osama bin Laden. Al-Zarqawi was responsible for many bloody attacks on Shiites and other targets, until American troops killed him on 7 June 2006, in Baquba. Sunni tribes in 2006 revolted against al-Qaeda in Iraq in its heartland, Anbar Province, and, with the support of the American occupation army, these so-called Sahwa militias beat back al-Qaeda. The extremists were not defeated, however, and attacks continued on a smaller scale. In 2010 the present leader of the Islamic State, Abu Bakr al-Baghdadi, became the leader of al-Qaeda in Iraq, or the Islamic State in Iraq, as it also came to be known. American authorities advised the Shiite-dominated government of Prime Minister Nouri al-Maliki to continue paying the tens of thousands of members of the Sahwa militias after the suppression of al-Qaeda or to incorporate them into the army or police, but Maliki refused. His regime cared only for its constituency, the Shiite majority. Shiite citizens got the best jobs, while the masses of the unemployed were dominated by Sunnis. Sunnis also predominated in death row after being sentenced—in what were considered by international human-rights organizations to be grossly unfair trials—for the terrorist attacks that were growing in number again. Sunnis were branded as terrorists and felt marginalized by Shiites, whom they began to consider oppressors. This development played into the hands of Sunni extremist groups such as Islamic State in Iraq. Many thousands of Iraqis were swept into an archipelago of US or Iraqi prisons for offenses, real or imagined. Thousands were arrested and held without trial, among them Abu Bakr al-Baghdadi. Accounts from the prisons describe them as “Jihadi universities,” wrote the Boston Globe. 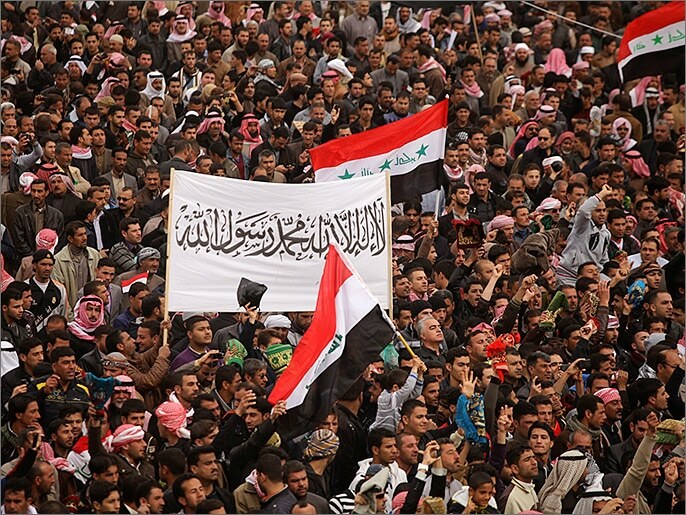 The mainly Sunni insurrection in Syria against Bashar al-Assad, the Alawite (a Shiite sect) president, that began in 2011, encouraged Sunnis to revolt in Iraq. Abu Bakr al-Baghdadi of the Islamic State in Iraq decided to extend his organization to Syria. In April 2013 he announced the formation of the Islamic State in Iraq and al-Sham (ISIS); al-Sham is greater Syria or the Levant, which encompasses also Jordan, Lebanon, Israel, and Palestine. IS conquered a large area in northern and eastern Syria. In January 2014 al-Baghdadi and IS profited from the ever-growing anger of Sunnis in Iraq about their marginalization under the government of Maliki to conquer Fallujah and Ramadi in Anbar, and the Iraqi army was unable to evict them. In June, IS conquered even Mosul, a city of about two million in northern Iraq. The Iraqi army fled, and anyone who fell into the hands of IS was slaughtered. Video images of beheadings and mass executions became a powerful propaganda weapon for intimidating enemies and recruiting jihadists from throughout the world. IS became the Islamic State (IS), and a caliphate was announced, with al-Baghdadi as the caliph Ibrahim.